X-rays are an important tool for evaluating fractures and determining the optimal treatment. This helps to identify if the fracture is “stable” or “unstable”, and assess how much “displacement” (or shifting between the broken bones) is present at the fracture site. Examining the hand is also important to look for abnormal alignment, resulting in a finger appearing “crooked”. Some fractures may also be rotated. When attempting to make a fist, a rotated finger will cross over (or scissor with) the neighboring finger. This is usually poorly tolerated, and these fractures tend to be treated with a reduction (see below). 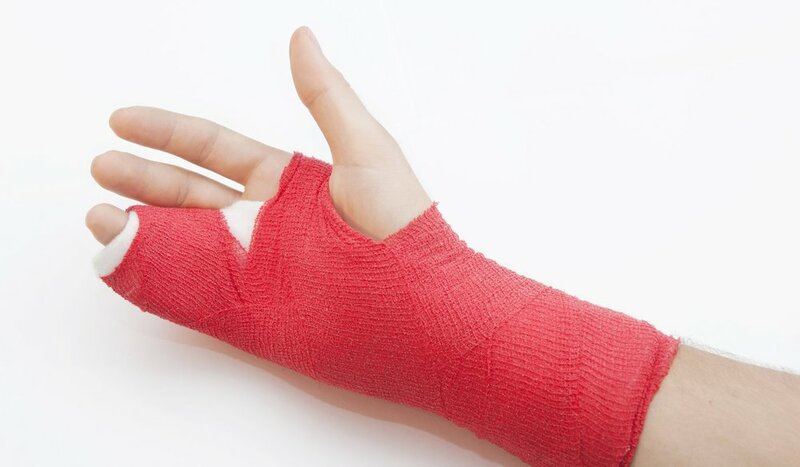 Stable fractures, or minimally displaced fractures, can oftentimes be treated in a cast or splint until the bone heals. When the fracture is unstable, notably angulated, notably shifted, or rotated – better outcomes may be achieved with surgery. This may involve setting the bone and placing metal pins across the fracture through the skin. Fracture of the 5th (small finger) metacarpal bone. When hand fractures are notably bent, or mal-rotated, surgery may improve alignment and motion of the finger. The images here show a small outpatient procedure. The fracture is reduced, or lined up, by manipulating the hand (no incision made). Next, 2 temporary pins are placed though the skin to hold the alignment during fracture healing. The pins are typically removed in the office 2-3 weeks after being placed. Motion is started at that point. More vigorous activities, such as lifting and strengthening, are started ~6 weeks after surgery. Fracture of the proximal phalanx bone of the ring finger. Spiral, oblique fractures such as this one tend to cause rotational deformities of the finger. 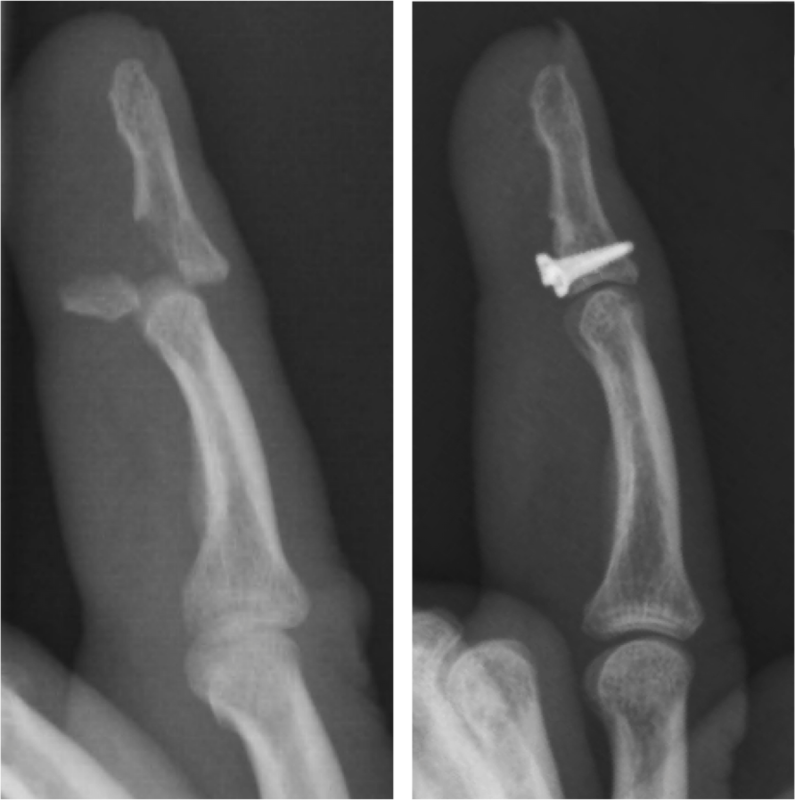 In the x-ray on the left, the ring finger can be seen overlapping the pinkie finger. The abnormal positioning will adversely affect function of the finger if it is left to heal in this bent and rotated position. An outpatient procedure can improve the alignment and allow the bone to heal in a normal position. As shown above, the fracture is aligned, and temporary pins are placed through the skin (no incision) to hold the two fractured pieces together. The pins are removed 2-3 weeks later in the office, and motion is started. Strengthening and more vigorous activities are resumed once the fracture has healed (~6 weeks). Occasionally, an incision may be required to line up the fragments of bone and hold them in place with a metal plate and screws. There are many different small metal plates and screws designed to fit along the bones within the hand. The optimal treatment depends on the fracture, its location and alignment, and the state of the skin and other soft tissues around the injury. Distal phalanx fracture. Sometimes the tendon that bends the fingertip, called the flexor digitorum profundus tendon, will pull off a piece of the distal phalanx bone. These injuries are oftentimes fixed with one or two small metal screws to hold the pieces of bone back together. Regardless of treatment type, some pain and stiffness is not unexpected throughout the healing process, and therapy is oftentimes used to achieve optimal motion, strength, and function of the hand.